After a long career as an ops agent for MI-5, Tom Bettany had had enough. He'd gone undercover for years to bust the McGarry crime organization, and that experience was a stain on the soul. When his wife was diagnosed with a brain tumor, he quit to be with her and their son, Liam. After Hannah died, the estrangement from Liam that had begun during his undercover years turned to a complete split. Bettany became a bit of a drifter, leaving England for France and taking strenuous physical jobs, like his latest one in a meat packing plant. When he gets a call saying that Liam died from a fall from his apartment balcony, where he had been smoking a powerful new strain of marijuana called muskrat, Bettany comes home. Not just to go to the funeral, but to find out exactly what happened. It doesn't take much of his old intelligence skills for Bettany to figure out that Liam's death was no accident. Now he needs to find out who is responsible and make them pay. With no official sanction and a fierce thirst for revenge, though, Bettany's methods of investigation lack a certain subtlety. In short order, he has problems with a whole raft of dangerous characters, including the muskrat distribution gang's kingpin, McGarry gang members, and the muscle for Liam's boss, who is a multi-millionaire video game creator. And when Bettany gets a call from MI-5, that's not good news, either. I got to know Herron's writing in the last couple of years, when I read his Slow Horses and Dead Lions. The books are about a group of MI-5 agents who have been exiled from Regent's Park, where the real intelligence action is, to Slough House because of various screwups and misdeeds. These castoff agents are expected to resign at the sheer humiliation, but they're determined to hang on, distinguish themselves somehow and scrape their way back across the Thames. The Slough House series books are terrific thrillers, stylishly written and with plenty of cynical humor. One running schtick is how the Slough House boss, the slovenly and casually offensive Jackson Lamb, is able to puncture the two top iron ladies at Regent's Park, Ingrid Tearney and Diana Tavener. 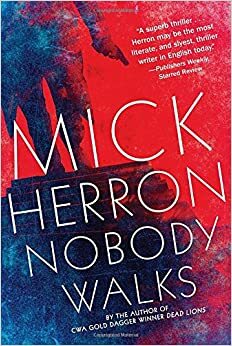 You definitely don't have to read the Slough House books to enjoy Nobody Walks. It stands on its own and has a different style. There is not much humor to be had in Tom Bettany's story. This is a grim and gritty revenge thriller. You can't call Bettany likable, but he's a riveting character and the story is both action-packed and thought-provoking, with plenty of twists and turns. If this book were made into a movie––which would be a great idea––I could see Daniel Craig or Liam Neeson playing Bettany. If you have read the Slough House books, I think you'll get a kick out of seeing the iron ladies, and you may wonder, as I do, whether Nobody Walks is the end of the Bettany story or if there will be a sequel. And if there is a sequel, might the Slough House gang come along for the ride? Notes: I was given a free advance review copy of the book. Versions of this review may appear on Amazon, BookLikes and other reviewing sites under my usernames there.